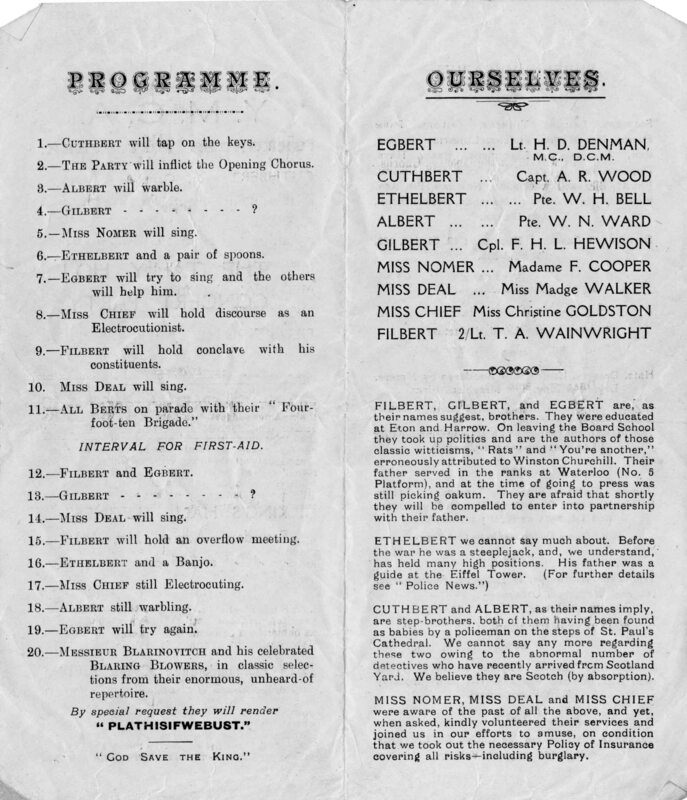 This programme for a Hunts Cyclist Concert was kindly sent to me by the son, Arnold Denman. He is the son of the Lt. H. D. M. C., D. C. M. Denman who plays Egbert in the production. Sadly the date of the performance is not known. Many thanks to him for allowing it to be reproduced here. We can only wonder what the production was like as no other reviews can be found for the works. There are also fleeting mentions of other concerts from local papers that all seem to indicate that they were quite common and varied greatly in their style. A HCB Smoking Concert was also held by the men in Yorkshire to entertain the locals, this one was organised by L/t McNish in January 1916.